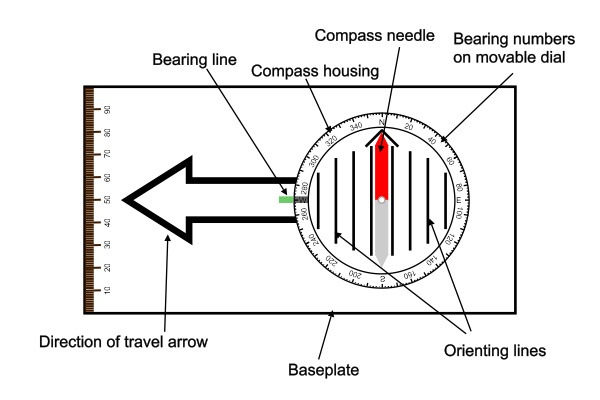 Here is a simplified drawing of a base plate compass showing the main parts you need to know about for navigation. Obviously, your compass will look different to the drawing but all of the main elements should be there in some form or another. Compare yours to the drawing and work out what is what – it will help you when you come to learn how to use it. Compass housing – is a liquid (often oil) filled container that helps the needle float nicely into position. However, be warned that cheaper needles tend not to float as well as expensive ones and so it becomes even more important to hold the compass very level to get a good reading – there are few things more annoying than following a bearing only to discover that the needle was stuck on the housing and you were completely off in your navigation. This is one of the many reasons not to skimp on buying a compass – in this you generally do get what you pay for. Compass needle – you, of course, know that this is the bit that points north. You only use the needle when you are following a bearing or taking a bearing to translate back to the map but it plays no part in taking a bearing from a map. The north end may be shown in a different colour than in the picture but make sure you don’t confuse the north with the south otherwise you will be going in the opposite direction – also very annoying. I had a friend once who didn’t know one end of the needle from another and feeling confused I followed him for about half a mile before challenging our direction and discovering he had the needle the wrong way around! Bearing numbers on movable dial – this is where the bearings are measured and are most likely in degrees. The armed forces use something called mills which is more accurate but not necessary for the rest of us. 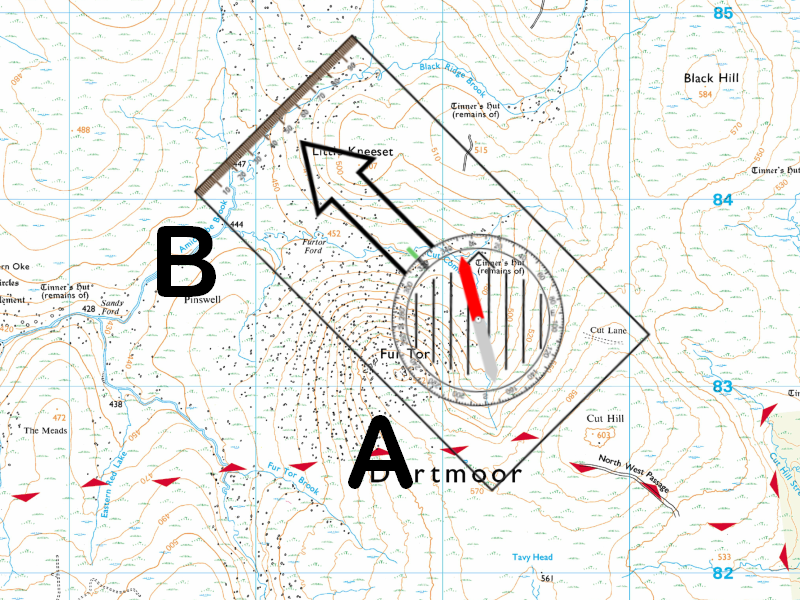 The processes for using a compass are the same whatever the scale is in but just make sure you are using the same system each time – you can’t take a measurement from a map in degrees and then try to use a mill compass! Direction of travel arrow – this arrow (sometimes two smaller arrows on either side of the baseplate – or even just a line) shows which direction you are going to travel in when you use a bearing. Set the bearing you wish to follow under the bearing line and with the needle lined up with the arrow on the compass housing (sometimes not an arrow but two thicker lines) the direction of travel arrow points you where to go. If you can’t find any then just use the front of the baseplate (the front will be the larger side). If you get confused it is the side opposite where the compass lanyard is tied. Baseplate – the rectangular part that the compass housing sits in usually with one side much larger than the other. There are often lots of handy scales on the baseplate but I have not drawn them in to save cluttering up the picture. Orienting lines – these are lines on the bottom of the compass housing (the bit that turns). Somehow the “top” or “north facing” part will be marked. There is often a broad arrow or two short bits of thicker line to mark the “top”. This is important because this is where you will carefully turn yourself to put the magnetic needle into this position when you are going to follow a bearing or take a bearing from an object. This is also important because when you take a bearing from a map this will need to be pointing to north on the map (usually the top). Get this bit wrong and you will once again be heading in the opposite direction. I have done this myself when I took a bearing late in the day when I was very tired but thankfully the problem was obvious and I was quickly able to correct it by using the compass back to front (lining up the arrow with south). Lay the edge of the compass base plate along the route you want to travel (e.g. start A to finish B on image). Make sure the direction of travel arrow on the base plate is pointing in the direction you want to travel. Holding everything firmly turn the compass housing (the circle bit) until the lines on the compass housing (the lines underneath where the needle is) are parallel to the blue grid lines (north south lines) on the map (with the arrow on the compass housing pointing to the top of the map). The bearing is under the line on the compass housing at the end of where the direction of travel arrow is. Take the compass off the map and correct the bearing for declination (the difference between grid and magnetic north). You should check this difference before leaving home or use the key on the map. Hold the compass in front of you (taking care you are not near or wearing anything magnetic or standing under power lines, etc) then turn your body (not the compass) until the red needle on the compass is lined up with the arrow on the compass housing (compasses vary on how this is marked but typically it is an arrow or two parallel thicker lines). The direction of travel is now pointed to by the arrow on the base plate. To follow the bearing locate a feature on that bearing (close but not too close) and walk to it and then repeat until you have reached your destination. Having the compass pointing in the wrong direction on the map and so getting a bearing 180 degrees out. The compass slipping when turning the housing.